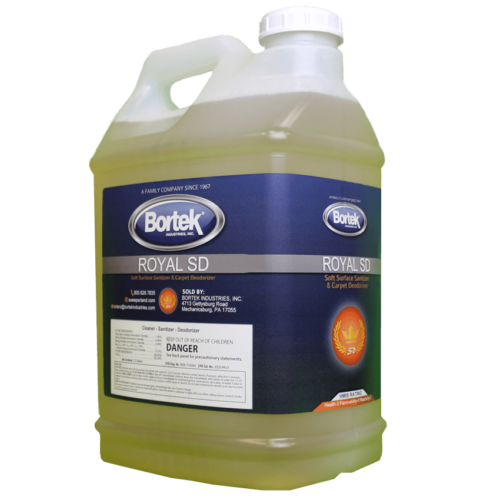 Royal SD- Sanitizer & Carpet Deodorizer- Bortek Industries, Inc. This product: deodorizes by killing microorganisms that cause offensive odors. Leaves a clean fresh scent. Proven effective soft surface sanitizer. Cost effective concentrate for use on soft surfaces. Sanitizes soft surfaces in 5 minutes. 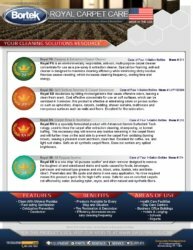 Use this product: to remove odors caused by flooding and smoke from fires. 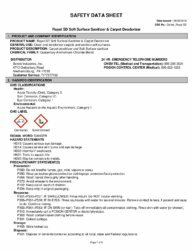 Use this product in: Health Care Facilities, Nursing homes, Day care centers, Nurseries, Business and office buildings, Hotels, Motels, Schools, Airports. Use this product on washable hard, nonporous surfaces of: Soft surfaces, Upholstery, Fabric, upholstered Couches, Sofas Chairs, seat cushions, upholstered cushions, pillows, upholstered furniture, fabric Window treatments, Curtains, Draperies,, fabric car seats. This product is effective at eliminating odors on porous surfaces such as upholstery, drapes, carpets, bedding, shower curtains, mattresses and non-porous surfaces such as walls and floors. Excellent for fire restoration. Weight per Gallon: 8.465 lbs./gal.